PETER Helliar has revealed that Rove McManus turned down an incredible $1 million offer from Channel Nine when he was just 23 years old. The offer was presented to McManus after Channel Nine chose not to renew his late night TV show, Rove, which lasted just 10 episodes on the network in 1999. 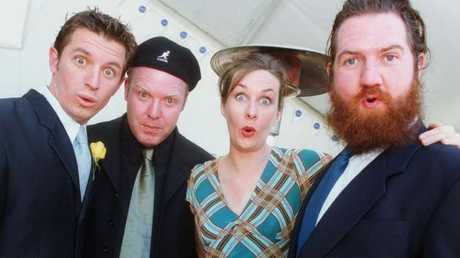 Rove McManus, Peter Helliar, Corinne Grant and Dave Callan in 2000. McManus co-hosted that show with Peter Helliar, Corinne Grant and Dave Callan, but Nine wanted the comedian to ditch his sidekicks. "They [Channel Nine] wanted to keep Rove," Peter Helliar told Rachel Corbett on her podcast, You've Gotta Start Somewhere. "He was offered a million dollars to stay ... but to cast everybody else adrift." McManus was just 23 years old when he was offered the huge amount of money and at the time he didn't have another offer from a rival network. But McManus turned down the cash, for two main reasons. "I think with Rove, the last thing he wanted to do was be put into a game show that he didn't want to do, and that was at the stage where people were paid good money to not do a lot," Helliar said. "Rove had no interest in that ... But also, I think he knew he had a good team." Gold Logie winner Rove McManus flanked by colleagues Peter Helliar and Corinne Grant, with the three Logies he won for his show 'Rove Live' at the 2004 TV Week Logies. It wasn't until seven months after he said no to Channel Nine that an offer came through from another TV station. They accepted and in 2000 McManus and his co-hosts started broadcasting Rove Live on Channel 10. Helliar was a part of Rove Live until the show ended in 2009 and in the podcast he praised McManus as an incredibly generous host. "We had a great chemistry and he was the most generous person on air," Helliar said. "There would be times when a joke would be in the air between us and we'd both see it and he'd always let me go for it, which is so uncommon."